We had another great turn-out and during the course of the day there were about 6 main activities going on! In the morning meeting Roger expressed an interest in getting the Piper Cub buttoned up and having the engine run for a bit before flying. Mike McCormick and Art Wilson spent part of the morning getting the Cub back together. At the end of the day, Roger Freeman took it up for a brief test flight. Very brief - it was cold up there! Sanford Swope and Tom Gaylord spent much of the day working on the Indian motorcycle. We did finish getting the fuel tank fitted, but ran out the remainder of the day trying to get a fuel line fabbed up. That task remains incomplete! Don Larson, Joe Bruno, Dave Miller, Gary Goolsby, Jeff Basham and Jo Hunter spent the day working on Tommy 1s upper wing panels. The team slipped on an envelope and glued down all the edges then shrunk the fabric taut and applied the first coat of nitrate dope. 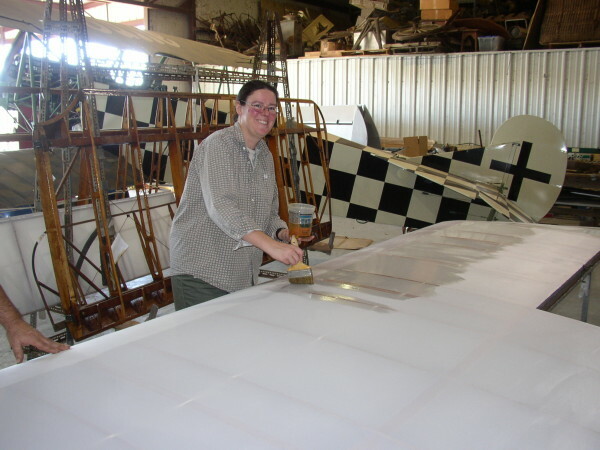 While the shrinking and doping were going on, the team also applied rib bracing tape to the other upper wing panel and got the cheesecloth leading edge cover glued on. The covered wing panel will be ready for rib stitching next time, while its mate will be ready for cover. The two lower wing panels need to be inspected for rough and jagged varnish spots, as well as big globs and drips of epoxy varnish which need to be sanded and smoothed before proceeding with cover. Al Sumrall, John Bush and his son, Johnnie Bush, were there to work on vehicles. They got several vehicles running, including the Nash Quad which was paraded around. Al drove and was wearing his WWI era uniform to give it a proper ambiance. Doug Hortvet worked on the Cub a bit (I think), but spent most of his day removing the Salmson radial engine from the Curtiss Junior. Roger has located soemone who can go through the engine to ensure everything is right. The suspicion is, since we've never been able to get the engine to run, some of it may be badly mis-timed. Terry Bledsoe and his wife were in the "new" hanger continuing to stow stuff and they spent the entire day at it. New shelving has been constructed and it seems as fast as they can get stuff stored more stuff shows up!! Terry also had help from Jeff Basham and Mike McCormick, and probably anyone else they could snag that was passing by! Terry's airplane has made visible progress, so that is encouraging. Roger has also continued to make excellent progress on the Great Lakes. The engine was mounted on the fuselage again and everything is looking very nice! Art Wilson has essentially been storing our D.VII's Gipsy Queen engine for the past several years while waiting for engine bearings to show up. He has been bringing back chuncks of the disassembled engine his last several trips to Kingsbury, and brought along the crankcase and crankshaft this time. The engine is back in storage while the trade continues to percolate. Roger has collected the Tommy parts the guy wnats, and he has the Triumph motorcycle that will form part of the trade. No word on the Gipsy Queen bearings which are also supposed to be part of the bargain. Roger mentioned that his brother Steve has created a restoration fund for his Thor motorcycle and Roger has started sending out parts for nickel plating and refurbishment. Al showed up with a bunch of extremely valuable documentation on Thors, so we may be treated to seeing this restoration proceeding rapidly. As for the Salmson engine, the issue may be timing, but in order to be started the Salmson needs a primer and booster mag (both of which are in the works, I believe). Probably all issues will be addressed at one time. Speaking of engines, it appears Old Pete's engine is coming closer to assembly. With the engine installed Old Pete looks quite attractive with that Spirt of St. Louis type cowl. I really look forward to hearing and seeing Old Pete Snarl into the air. 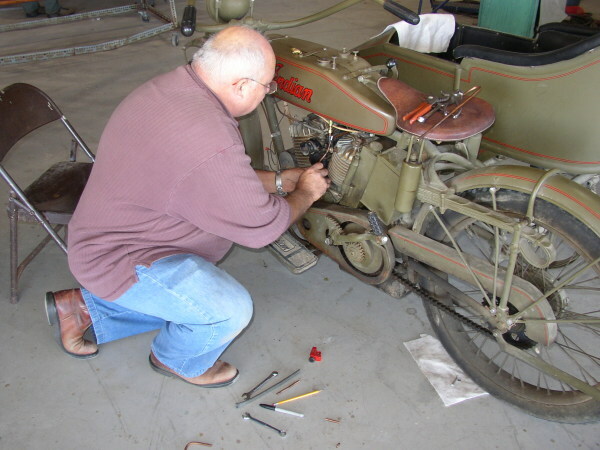 In addition to the Salmson work, Doug H. fixed a problem when a spring came loose on the Quad throttle. He also helped to restart the Quad after the repair. Jeffrey Basham, who has been very patient with us in not calling him by his proper name, worked with me on the Quad (the Quad and I had some issues all day--it appears we may need to take out the gas tank and give it and the fuel line a good cleaning) and he drove it. Jeffrey has an ancestor that drove heavy trucks during WWI in the US Army. As compared with the Ts the Quad is a very, very different vehicle. It operates like a standard stick shift except with a hand throttle and as such is more conventional by todays standards. .
New volunteer Errol Lee came with John and Johnny Bush and brings a good mechanical- engineering background. Now if we can only keep team aircraft from "stealing" him. Three Ts were started by their efforts... and I say efforts because the Ts are extra stubborn in cool weather and the morning starting process is labor intensive. I am going to be working with John to see what we can do about lessening the efforts to just get these vehicles started. They run fine after starting but starting is always a seige with the current battery situation. I think we need three additional 12 volt car batteries to start a rotation. The current starting procedures we use are taking up too much time and energy. We have too many other things to do. I know at times it appears that we vehicles guys are always having fun driving the vehicles but they are still very labor intensive and there are a ton of fun things left to do regarding maintenance and and preservation as well as getting more of the fleet on the road. As always, we need new volunteers as well as old ones that may have drifted away over time to come back. There is a lot more to do and work on than when I first came here a little over two years ago and a lot more fun stuff going on. The more the merrier!. Even people like me who are only qualified to push a broom get drawn into exciting projects. John ? 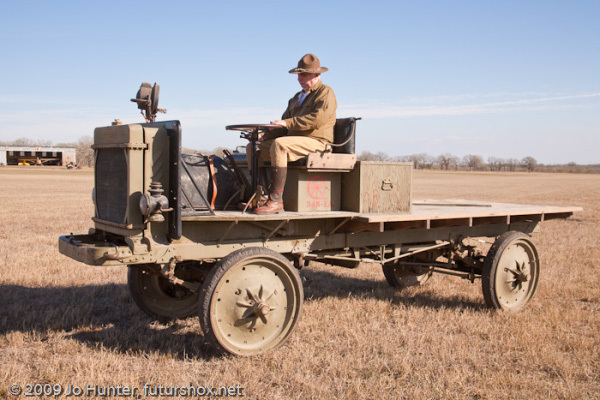 (I apologize for not always getting the last names of folks) is doing great work on restoring the FWD (Four Wheel Drive Company) vehicle which is another type of four wheel drive heavy truck (the Nash Quad is the other) used in the great war by the US. At a glance they look the same but they are very much different in the details and once the FWD is completed that will be easy to see. There are very few museums in the world that boast both an FWD and Nash Quad at the same place. The frame of the FWD used to be out at the front of the shop with the Owl on the steering column. Now it has been moved over near the shop hangar where John is working on it. He is currently restoring the cab area in the main shop and it is quite interesting to watch his progress (the Owl is sitting on the seat). During a short interlude when I was allowing the Quad to rest (after it died due to probable fuel line clogging) I went into the old hangar where I saw Mike and Terry and his delightful wife, who I cannot remember her name.....woe is me) working on the massive shelving project that has taken so much of Terry's time. For the time I was in there, Jeffrey and Terry where doing acrobatic work installing frames on the shelving with Mike on the ground. Terry's tenacity at staying with this important work is mind-boggling over the many, many months he has concentrated in the new hangar, organizing and reorganizing the material and making room for aircraft. Terry and his wife an Doug Horvet were working late into the evening moving things and cleaning above the main office in the shop as I left. As for the Indian, Tom and Sanford dove into the project. Near the end of the day I had a chance to "inspect" (as if I knew what I was inspecting) their work and it was impressive. The new fuel line was a necessity and Tom and Sanford clearly know what they are doing. We are getting much closer to having a convoy that can perform during the airfare. Right now we have the Signal Corps Truck, Indian motorcycle, and Nash Quad that could be operational at the May 09 AirFair. With a bit of luck, it is possible that a new engine could be installed in the US ambulance (need clearance) and if the engine operates as it should we could have a four vehicle military convoy. At the least, this is a goal.